Tamashii Nations recently released the S.H. 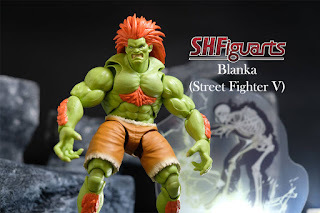 Figuarts Blanka from the Street Fighter franchise. Blanka is about 160mm in height and probably one of the most articulated and flexible figure in the S.H. Figuarts line. Check out the video review after the jump. Inclusive in the set are 2 fists, open-mouthed faceplate, stage background and diorama of electrocuted versions of Ryu and Chun-li. Released in March 2019, the set is priced at 7,560 yen as a Tamashii Web Shop Exclusive.